Since I started blogging for Make Tech Easier, I have had to ensure that all my photos and screenshots did not exceed the maximum size for the post. 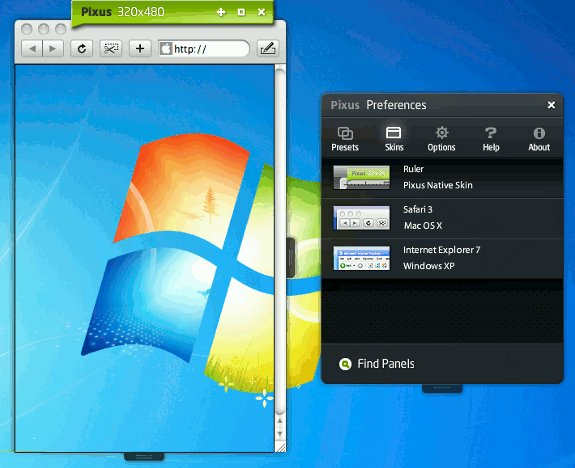 While there are numerous photo-editors that could cut down a pictures dimensions, it is often better to ensure that the original screenshot you take is of appropriate size. To do this I have found a number of “screen rulers”. 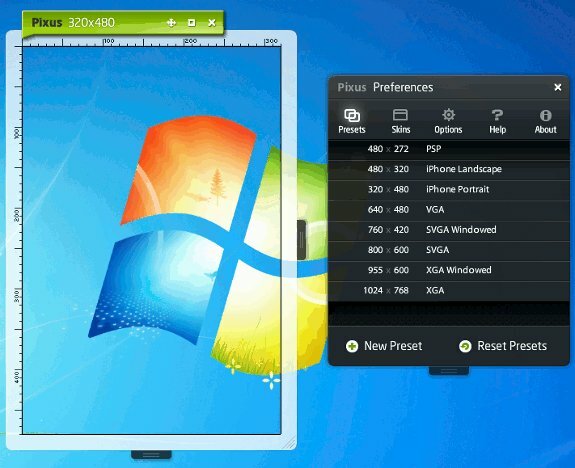 These small applications look identical to physical rulers except they float on your desktop and measure the pixel size of a given window. I have come across a lot of these applications and some are immensely helpful especially for web designers or those that simply want to know how big something on the screen actually is. This is probably one of the simplest rulers I used. The application itself is a fairly standard looking wooden ruler. The buttons along the bottom allow you to adjust the rulers length, to change it from vertical to horizontal and to change the look of the ruler (steel, yellow, etc.). Of course you can also launch as many rulers as you like by clicking on the shortcut. 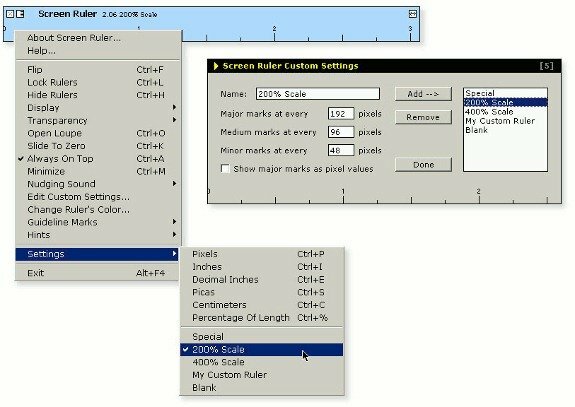 JRuler does not have the sleek looks of A Ruler for Windows, however it makes up for it by having the option to change the measuring units to pixels, inches, picas or centimeters. This would be particularly useful if you are printing brochures or similar on odd sized paper. 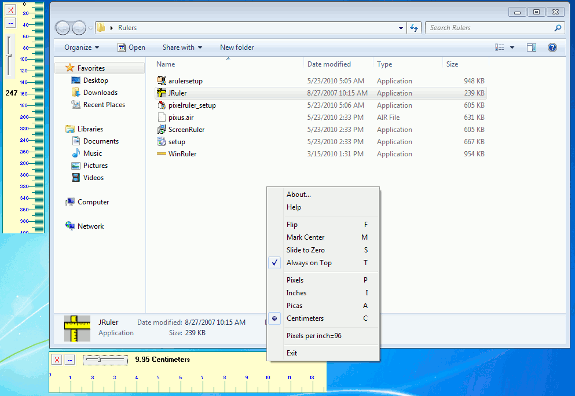 JRuler is free and requires no installation, it runs from an executable file. 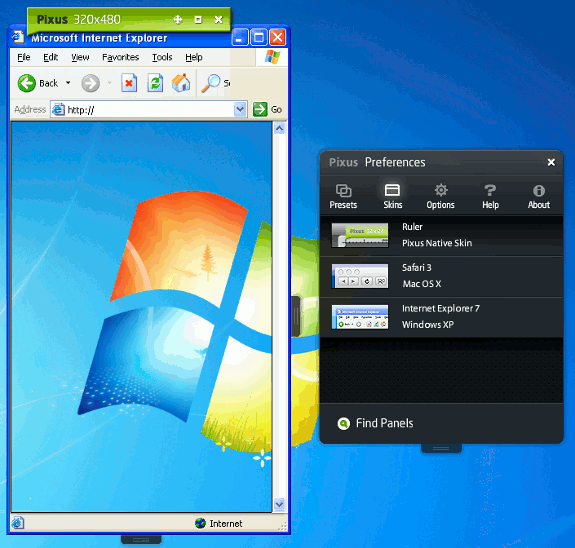 There is also a Pro version that has more features. 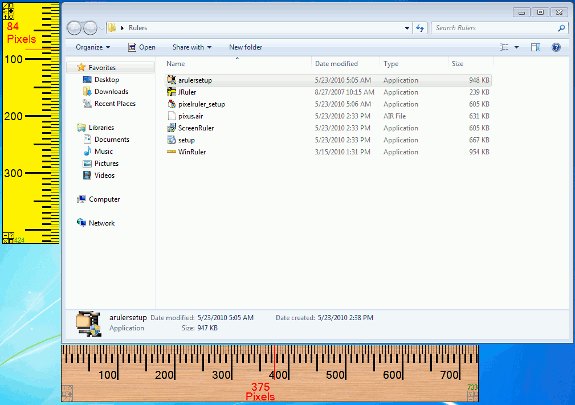 Pixel Ruler is a very limited application, offering no features besides the ability to resize the ruler. In addition, there does not appear to be any way to launch a second ruler. 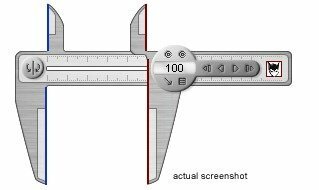 Having said that this ruler did have the ability to track the position of the cursor anywhere on the screen (even off the ruler itself) and display its distance from the start of the ruler. 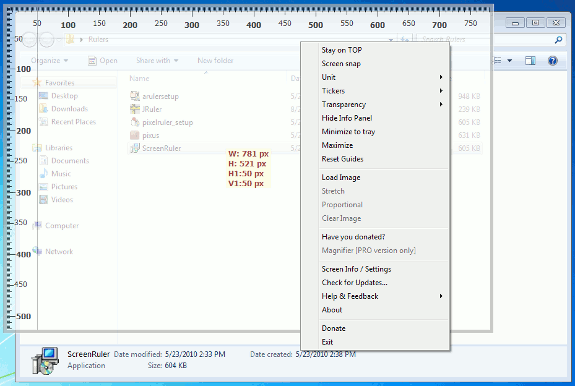 WinRuler does not seem to differ greatly from the rest of the reviewed rulers, however it does offer the unique ability to measure the percent of the screen that the ruler is being used for. In addition, there are a number of options to calibrate the size and look of the ruler itself. Unfortunately, I was unable to launch another instance of the ruler. While this ruler appears, on first appearance, to be fairly complicated, its basic feature-set is identical to most of the other rulers reviewed. Instead of having to launch two rulers to measure the horizontal and vertical, Screen Ruler comes with markings along the top and side. However, the transparency is set fairly high on the initial launch and it is necessary to lower it so as to be able to see the object behind the ruler. Again, this Adobe Air application seems to be aimed towards website designers and I personally did not find it very helpful for my purposes. 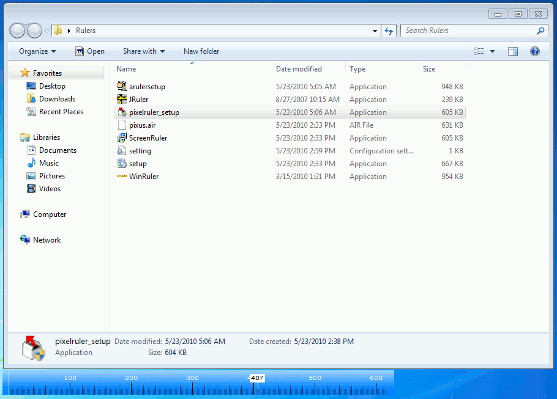 I also found a number of applications that provided far more features but at a price. For the sake of completeness I have added them to the list. Reviews suggest that this paid application is possibly one of the best screen rulers available. There is a 30-day demo after which you have to pay USD 29.50. 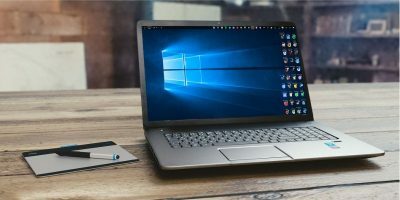 It works on both Windows and Mac. xScope is Mac only, comes with a demo and costs USD 26.95. 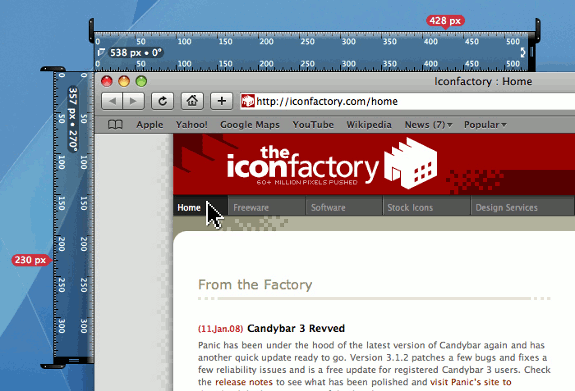 The market for screen rulers is very limited as only a web designer would really require such a thing on a daily basis. However, as most of the applications are free and relatively painless to use, I am sure there are many novel ways to utilise them. I personally like using A Ruler for Windows as it affords me the appropriate balance between looks, simplicity and feature-set. I did find a few good looking Mac and Linux rulers but since I don't have either I was unable to test. 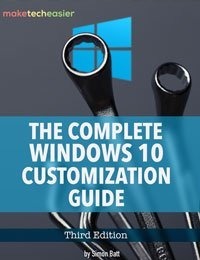 With A Ruler For Windows you can now add your own skins. Hope it can be of good use to you.